There is a tendency that the success of some of the village-level savings groups in Laos inevitably causes an excess funds problem, because the activity of a saving group is confined to a small village territory. Given the lack of efficient and reasonable system for coordinating between funds-surplus and funds-deficit savings groups, the excess funds problem of funds-surplus savings groups leads to a stagnation of such groups, whereas other funds-deficit groups continue to suffer from the fund shortage. The paper, based on a case study of a village in Vientiane Municipality since 2003 until 2012, analyzes how various stakeholders responded to such an excess funds problem with an apparent failure in the study village and alerts the policy-makers in Laos to make necessary measures, since the excess funds problem is also providing a good opportunity to establish a broader and integrated institutional financial system in rural Laos. The Village Savings and Credit Group (hereinafter, SG) in Laos is basically a closed, village-level financial group. Membership is confined to villagers, and savings mobilization and credit extension are limited to the members. Roughly 70% of profits from credit operations are distributed as dividends once a year to members in proportion to their savings amount. In general, at first, demand for credit exceeds savings and because external institutions generally provide no, or very little, seed funding, so an SG inevitably rations credit.1) Later, as the group develops and savings accumulate to a certain level, savings begin to exceed credit demand. Lowering the interest rate, which is a common adjustment measure, has an apparent inhibitory effect on the development of SGs as a reduced interest rate discourages savings mobilization, although a substantial savings surplus exists among village households. Such SGs suffer from an excess funds problem. We also note the existence of many SGs that suffer from shortage of funds in a prolonged period. To avoid such a scenario, SGs require a system to coordinate the gap between demand and supply among funds-surplus and funds-deficit SGs. When SGs as a whole have excess funds, the surplus money should be transferred to external financial markets. Through such a developmental process, SGs can be integrated into the broader financial system, thus contributing to the development of the nation-wide financial markets. The agricultural cooperatives in Japan, for instance, established the three-tier cooperative system—village-level, prefecture-level, and nation-level—to transfer excess funds from village-level cooperatives to a nation-level cooperative bank (see the first paper in this special issue by Ohno) and thereby supported the formation of the country’s more efficient and integrated financial market. In Laos, some SGs, especially those in Vientiane Municipality, began facing an excess funds problem several years after establishment. The present study examines the responses of the various stakeholders—committee members and advisers of an SG, villagers, NGOs (Foundation for Integrated Agricultural and Environmental Manage ment [FIAM] and Community Organizations Development Institute [CODI]),2) and the Lao Women’s Union (LWU)—to this problem. This study’s major objective is to investigate the excess funds problem, focusing on the aforementioned stakeholders’ responses through a detailed case study of a village in Pakngum District, Vientiane Municipality. By analyzing the process of the development of SG, this study also identifies the SG’s impact on the village financial market and economy. The paper proceeds as follows. In section 2, we describe the study village on the basis of a household survey of 75 sample households, followed by a discussion of the SG’s development and impact on the village economy in section 3. Section 4 presents the process that caused the excess funds problem and the methods by which the SG committee and other stakeholders attempted to manage it. Section 5 presents the conclusions. FIAM and CODI began organizing SGs in Vientiane Municipality (hereinafter, Vientiane) in 1997. By December 2003, a total of 217 SGs were formed in Laos, covering nine districts ( muang) of which five were in Vientiane (Table 1). A total of 178 SGs existed in Vientiane, concentrating in the Xaythany District (92 villages out of 103) and Pakngum District (53 villages out of 53). Also notable was the amount of savings: as of December 2003, 217 groups had accumulated 5.89 billion kip (averaging 27.2 million kip per group),3) of which 145 groups (roughly two-thirds the groups) in Xaythany and Pakngum Districts had accumulated 4.99 billion kip (84.7%). Source: LWU and CODI (undated). Villagers began brewing jees roughly 20 years before the 2003 survey, and 36 households (roughly 25%) were engaged in this cottage industry in 2003. Village statistics reported 184 heads of cattle, nine buffaloes, 80 pigs, and roughly 2,000 chickens. Fisheries were unpopular in the Mekong River, and only a small-scale operation was observed for self-consumption. Many emigrants from the village worked in the USA and regularly sent money as remittances. Roughly one-third of the households received such regular support from family/relative members in the USA. The remittances were sent in cash (US dollars) in a letter, instead of utilizing banking networks. A total of 75 households (51% of the total) were randomly selected for a questionnaire survey in July 2003. Table 2 shows population characteristics of the sampled households, which were categorized by landholding size of paddy field. Of the 75 households, 7 (9.3%) were landless non-farm households, which neither owned nor rented farmland (including garden land). The average age of heads of landless non-farm households was 32.4 years, far less than that of farm households (49.2 years on average).7) Among the farm households, it was observed that the larger the farm size, the older the household head. Table 3 shows the distribution of farmland and other basic information for the sampled households. The majority of farm households (47 out of 67) had less than 2 ha of paddy field, whereas 12 farm households owned more than 3 ha. More than 10% of paddy fields were rented out, mainly to land-poor households. The average land holding size of garden land was only 0.5 ha, but it was more equally distributed among the households. Twenty-nine percent (29.3%) of households were engaged in jees brewing (including yeast making). One-third of the households regularly received remittances from abroad. Table 4 shows that the average number of livestock holding per household was 3.1 cattle, 3.1 pigs, 10.5 ducks, and 16.8 chickens. Interestingly, small farmers had more cattle than large farmers. Source: Survey by author in 2003. Notes: 1) Farm size includes only lowland paddy fields. 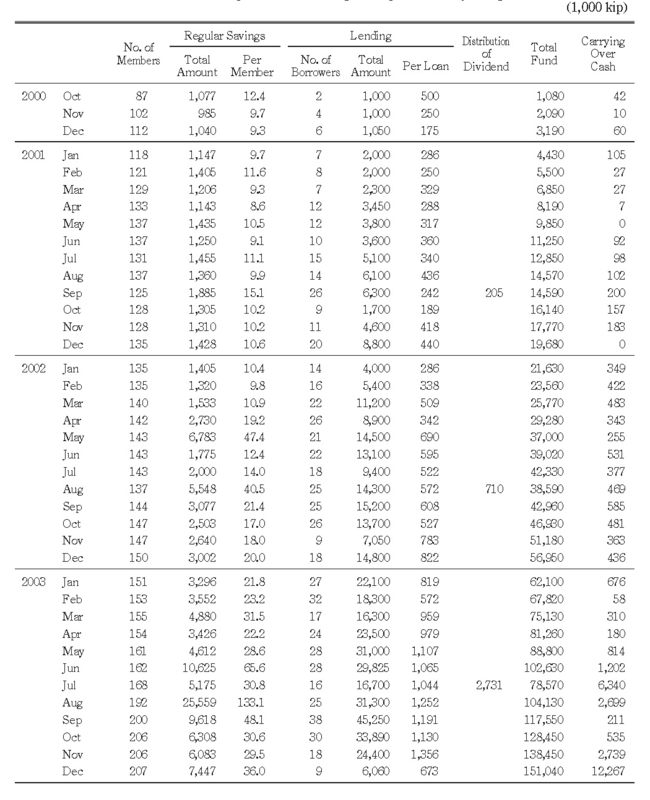 2) The total number of households in June 2003 was 147. Note: 1) Lowland paddy fields only. The distribution of non-land production assets was skewed in favor of land-rich households (Table 5). Power tillers and irrigation pumps were widely diffused among large farmers. The distribution of consumer durables (Table 6), however, had no clear relationship with landholding size, except for the smallest farm size class (0–0.99 ha). One household had, on average, three electric fans, one TV set, one bicycle, one refrigerator, 0.6 CD players, and 0.5 motor bikes. Sewing machines were diffused more widely among the land-poor households. In sum, the study village had quite an egalitarian agrarian structure. Although disparity in the land holding size of paddy fields was quite large, it did not necessarily correspond to each household’s economic status. At the time of our July 2003 survey, the minimum amount of monthly savings was 10,000 kip (approximately US$1).11) Only female members could apply for a loan, with a ceiling of five times her savings amount at an interest rate of 4% per month.12) The loan period was basically four months but could be extended to six months. On the first day of each month, all the transactions were completed. In the morning, the committee received three kinds of money: regular savings, interest payments, and principal repayments. In the afternoon, the committee disbursed new loans for the previously approved applications. Table 7 and Table 8 summarize the development locus of the SG. As the tables report, the SG of the study village developed quite rapidly and smoothly. First, the number of members, which began with 87, increased to 168 (from 92 households) in July 2003. It jumped to 192 in August 200316) and further increased rapidly, exceeding 300 in September 2004 and 400 in July 2005. Almost all the households participated in the SG. Although the number of households and population of the village also increased, on average two to three members of each household became the members of the SG. Third, despite the relatively high lending interest rate (4% per month),20) members showed a strong demand for loans, leaving a very small amount of funds in the hands of the committee. Under such a chronic excess demand for loans, the committee had to ration credit, granting priority to urgently needy members and members with small loan amount applications. However, as the shortage of funds eased, the average loan size increased; it exceeded 0.5 million kip in March 2002 and 1 million kip in April 2003. Source: Prepared by author based on documents collected from the savings group office. The financial market of the study village was rather simple before the advent of the SG. The only formal financial institution that villagers could use was the Agricultural Promotion Bank (APB), and its local branch was located in Naxon village on national highway no. 13, roughly 22 km from the village. Villagers’ other sources of credit were informal, including relatives and friends, traders, shopkeepers, and professional moneylenders. The APB Naxon local branch was established in 1996 with six officials, including one head of the branch, two accountants, one cashier, and two loan officers. Table 9 summarized the savings and loan amounts of the local branch as of March 2004. As seen in Table 9, the amount of savings reached 728.0 million kip, comprising 3.6 million kip of current accounts (0.5%), 333.9 million kip of savings accounts (45.9%), 312.3 million kip of time deposits (42.9%),21) and 78.2 million kip of APB bonds (10.7%). The amount of loans reached 1,743.6 million kip, including 999.9 million kip of crop loans (57.3%), 116.3 million kip of business loans (6.7%),22) 274.0 million kip for livestock raising (15.7%), and 322.5 million kip for farmland development (18.5%). The amount of loans far exceeded savings mobilized by the local branch. Note also that the term loans such as those for farmland development and farm equipment did not correspond with the terms of mobilized savings, because most of them were termed within one year. APB provided crop loans through a group lending system under which farmers formed a group of 4–10 persons. Such a new system facilitated quick disbursement of loans without collateral, although the amount of loan per borrower was rather limited. Loans other than crop loans provided directly to individuals were relatively larger, but they entailed cumbersome formalities, including provision of collateral.23) However, the APB Naxon local branch had non-performing loans (NPLs) totaling 58.5 million kip, 80.5% of which were crop loans. According to the head of the local branch, this situation resulted largely from natural disasters such as flooding and pest infestations, especially in the monsoon season. Therefore, it can be said that the group lending system functioned rather ineffectively for recovering loans. Source: Interview with head of the local branch in March 2004. In Don Neua, five groups had received APB crop loans as of March 2004. Encouraged by APB officials, 11 farmers formed the first group in January 2001. According to a farmer who joined a group created in April 2003, six farmers with 1–2 ha of paddy fields formed a group that borrowed crop loans twice a year for monsoon season and dry season rice cultivation. The loan amount was 1.5 million kip for the monsoon season (six months) and 2 million kip for the dry season (five months), with an interest rate of 12% per annum. 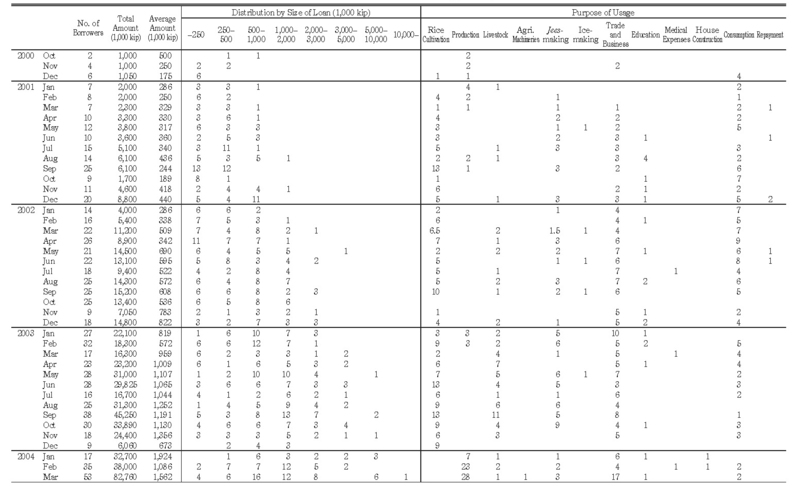 Table 10 summarizes the borrowing status of the sampled households in July 2003. The sources of loans were categorized into informal credit, APB, and the SG. The table reveals that 15 households (20%) borrowed from APB (12 households through the group lending system and the rest 3 households through the individual lending system), whereas 17 households (23%) borrowed from informal sources. Note that non-farm households were excluded from APB loans and more than half of them borrowed from informal sources. In contrast, 65% of the sampled households participated in the SG, and 69% of the member households borrowed from the SG. The number of borrowers from the SG, 34, far exceeded the number of borrowers from APB and informal sources. The loan size was the largest for APB individual loans (on average 7.7 million kip), followed by SG loans (1.5 million kip), informal credit (1.4 million kip), and APB group loans (slightly less than 1 million kip). Table 11 shows the interest rate structure of informal credit, which exhibited bimodal distribution; that is, interest-free and a high interest rate of 10% per month were most common. Note that the APB loan interest rate was 1% (group lending) or slightly higher than 1% (individual lending) per month, whereas the SG charged 4% per month, as noted. The interest rate of the SG was much higher than that of APB, but lower than that of informal credit. Table 12 shows the purpose of SG loans, based on information obtained from the sampled households. (Figures in Table 8 were based on the records of the SG committee.) The result was close to that of Table 8, but the household survey additionally revealed a positive correlation between larger loan amounts and production purposes, especially pig raising. The strong demand for loan in the study village was basically for various production purposes such as rice cultivation, livestock rearing, jees brewing, and trade. According to several village informants, a major impact of the SG was the eradication of standing crop (paddy) sales, which were previously widespread. The custom was that if farmers sold at the time of transplantation (about four months before harvesting), buyers offered only half the expected price at harvest, and if they sold two months after transplanting, they received only 60–70% of the expected price. It was reported that the major buyers were either villagers with a large amount of regular support from abroad (largely the USA) or village-level traders. The effective rate of interest involved in these transactions was estimated as high as 20–25% per month. Study results thus suggest that although the SG loan interest rate was much higher than APB’s, the SG provided villagers a much easier source of credit with reasonable terms and conditions, and thereby contributed to production activities and poverty eradication.24) Most importantly, the SG, unlike major microfinance institutions such as the Grameen Bank in Bangladesh, mobilized villager savings and extended them to villagers who needed loans, filling local needs while generating interest income, and thus serving as an efficient intermediary between villagers with funds-excess and funds-deficit. Table 7 reported information on “carry-over cash” in the hands of the SG committee. Carry-over cash was almost nil (below 1–2% of total funds) until the end of 2003. The demand for credit in the village was so strong that nearly all the funds (including the reserved funds and welfare funds) were extended as loans. However, the carry-over cash began increasing in 2004, when more than 10% of total funds remained after extending loans. Note that the SG opened an APB savings account in January 2001 but did not deposit the surplus money at APB. Instead, they divided the money among the five committee members and retained it in each household. The committee members report that only a very small amount of money was deposited in the bank account, primarily because the APB local branch was too far from the village. If the excess funds become too large, the profit and member dividend decrease. The major reason for villagers depositing money in the SG was the high dividend rate of slightly less than 2.8% per month. The SG committee responded to the new situation as follows. First, they decided to reduce the monthly lending interest rate from 4% to 3%, by which they intended to increase the demand for credit while discouraging members from saving. Second, to increase the demand for credit they decided that male members were also allowed to borrow from the SG. Third, they tried to invest the surplus money in pig raising as a venture of the SG itself; however, because pork prices declined, they soon stopped after incurring a loss. Finally, they decided to extend loans to non-members, especially persons living outside the village. Soon after they implemented the final measure with large loan amounts, a serious problem arose. Many of the outside borrowers did not repay the principal, although they continued to pay monthly interest. According to the information I obtained when visiting the village in September 2008, a total 96 million kip of loans to 16 outside borrowers had become NPLs. At that time, the total loans extended by the SG was slightly less than 700 million kip (Table 7), with roughly 15% NPLs. Because the committee members did not provide me with the detailed record of the SG, Table 7 lacks data from September 2005 to June 2007. When I discussed this issue with the head of the village (one of the SG consultants), he disclosed that even he did not know about the committee’s 2005 decision to extend credit to outside borrowers and became aware of it only after it developed into a serious problem. The committee members reported that the total funds in February 2012 were 1,289 million kip, with NPLs at 66.7%! If accurate, the financial situation posed a critical problem for the SG. Since 2009, the committee members had been gathering two to three times a month to discuss this issue. The committee also decided to reduce the lending interest rate further to 2% per month (from the former 3%) since the beginning of 2012. At the time of the survey in February 2012, the total number of members was 847 (with 444 females), which exceeded 810, the total population of the village, because some emigrants from the village remained as members. It was reported that of the total 160 households, all except 3 “poor” households participated in the SG. After the lending interest rate reduction, the members of 34 households (of 157 households) stopped providing monthly savings and also tried to withdraw their savings. How had CODI (WECP)27) and LWU, both of which were responsible for supervising the SGs, reacted to such a serious situation in the study village? My February 2012 interview survey at the LWU Pakgnum District Office found that they became aware of the problem in Don Neua only in 2010. They provided no clear plan of how to solve the problem. According to the LWU Pakngum District Office, the excess funds problem in the district was as follows. Only one SG other than Don Neua, extended loans to outside borrowers, and the other village had so far had no serious problem like Don Neua’s. The excess funds problem occurred in several other villages as well (among the total 53 SGs in the district), but all the other villages, except for these two, attempted to solve the problem through an official system, that is, extending loans to other SGs through coordination of the khet-level SG. However, the LWU Pakngum District Office stated that although this system began in 2005, very few SGs had extended loans to other SGs. Only three khet of the six in the district had experienced such transactions. Our interview survey at the office of FIAM in 2007 found that it had introduced a system of transferring excess funds between SGs. But it was found that the system neither ensured sufficient profits to SGs which provide excess funds nor did it provide funds at a low lending interest rate to SGs with funds-deficit, because the system took a high margin in the intermediaries between two SGs.28)29) It seems that this institutional deficiency was the major reason for these systems’ unpopularity. In sum, results demonstrate that Don Neua might be an exceptional case where the excess funds problem developed into a very serious situation; however, the problem in Don Neua became so serious because the overall auditing system for the SGs was very weak and lacked a risk mitigation mechanism. The core problem may lie in the failure to establish an appropriate system of transferring funds from SGs with funds-excess to those with funds-deficit or to broader, less risky external financial markets. At the time of my February 2012 survey, six months had passed since CODI (WECP) withdrew from the SG program. LWU could not establish a new monitoring system for the SGs. Some of the SGs organized in Laos since 1997 have experienced great success in that they mobilized considerable savings in rural areas in a short period and extended the savings to members in need as loans with reasonable terms and conditions. Such SGs contributed to the villages’ economic development and alleviated poverty by eradicating exploitative informal credit such as that on standing crop sales. The most important point is that the SGs, unlike the major microfinance institutions such as the Grameen Bank in Bangladesh, mobilized rural villagers’ savings and extended them to villagers who needed loans, and thereby have served as an efficient intermediary between villagers with funds excess and those with funds deficit. Efficient, since they successfully reduced transaction costs for transferring funds between villagers within the same village boundary. The SG in the study village had been one of the greatest successful cases. However, that very success, because of its rapidity, created a trap. 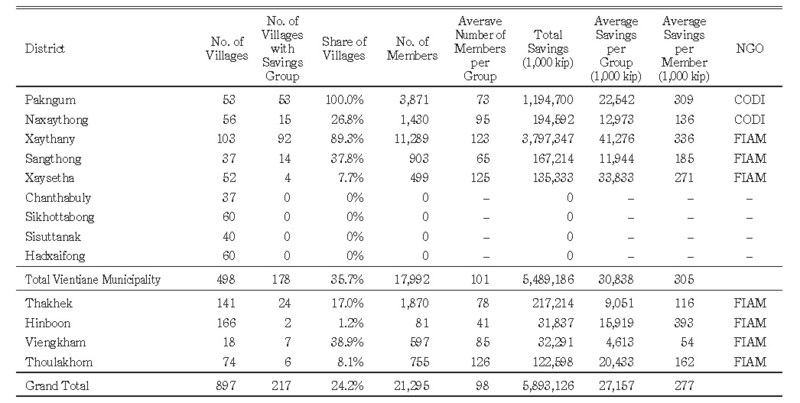 Because of the high rate of return for savings (at slightly less than 2.8% per month in Don Neua), villagers tried to make the largest possible deposits by increasing the number of members from the same family and by increasing their amount of monthly savings far beyond the minimum obligation. Finally, the accumulated savings exceeded the demand for credit, and a substantial amount of carry-over cash remained in the committee members’ hands. The basic problem lied in the system that the activity of the SG was confined to their village. There was no demand for credit any more in the village. The committee members could not determine a solution for the issue, given the members’ high expectations for maintaining high rate of dividend. They even began a pig-raising investment project to obtain profits, but that project failed because the price of pork fell. They made their final decision to extend loans to entrepreneurs outside the village without consulting even the local SG consultants. And they finally faced a serious problem of non- performing loans. The success of the SG in the repayment of loans can be attributed to a kind of community function at the village level. As the villagers remain in the village or have close day-to-day relationships, even if they migrate to other areas, they feel obligated to avoid outright non-repayment of loans extended by their SG. However, this control does not affect outsiders, as demonstrated by the Don Neua SG’s serious problem. 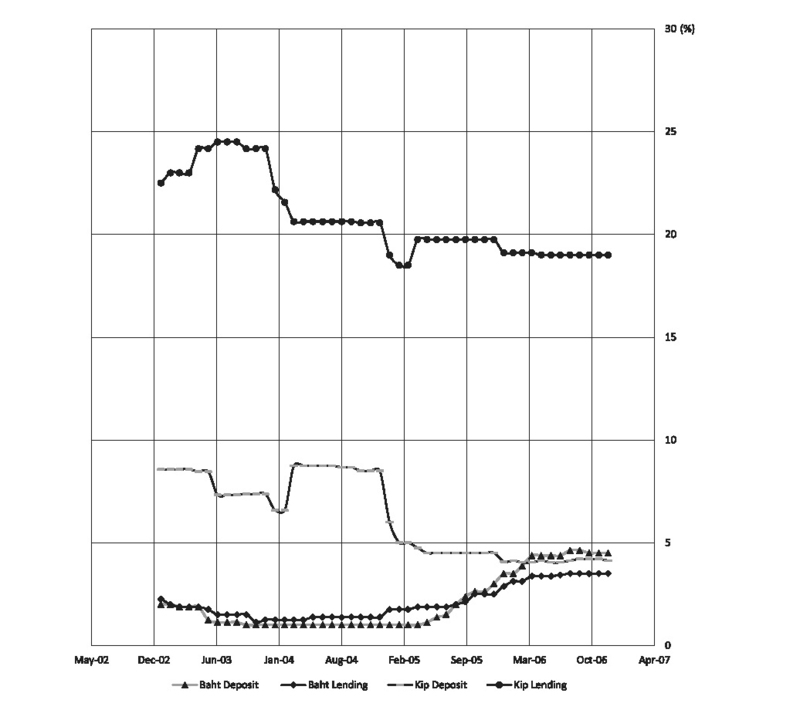 The committee members had too optimistic predictions of outside borrower behavior. However, if SGs continue to confine their activity to their village, the falling rate of dividend will make villagers to stop savings after a certain point. The most important task for the policy-makers in general, or the SG supervisory organizations (such as FIAM, CODI, and LWU) in particular, is to establish an efficient and reasonable system for transferring funds between SGs, and a system for transferring funds to external financial markets after the SG funds become excessive as a whole. To date, Laos has experienced apparent failure in these core system elements. The absence of these elements is the root cause of the Don Neua SG’s failure. The experiences of other countries, especially Japan, suggest a solution to the problem of excess funds, which several successful village-level SGs in Laos now face: treating the situation as an opportunity to form a broader, integrated financial market in the country, involving the vast rural areas. Lao Women’s Union; and Community Organizations Development Institute. Undated. Saving Group and Poverty Alleviation; Report on the Promoting and Expanding of the Saving Group in Lao PDR. mimeo. Ohno, Akihiko; and Arimoto, Yutaka. 2005. Saving Group and Credit Markets in Rural Laos. In Macroeconomic Policy Support for Socio­Economic Development in the Lao PDR, edited by Committee for the Planning and Investment, Lao People’s Democratic Republic and Japan International Cooperation Agency, pp. 370–393. Tokyo: Japan International Cooperation Agency. 1) The case of the study village’s SG gave priority to members with urgent needs and small loan amounts. 2) FIAM is a Thai NGO. CODI is a Thai semi-governmental organization. The system of governing SGs is almost the same for the two institutions. See Ohno and Arimoto (2005) for SGs under FIAM. 3) The exchange rate in 2003 was roughly US$1 10,000 kip. 4) There was another village, Don Tay (“tay” means south while “neua” means north in Lao language), which was separated from Don Neua village during the 1960s, although the two villages’ residential area was continuous. In March 2003, Don Tay had 71 households and 345 people, including some migrants from Thailand. 5) A pump was installed in the territory of Don Tay in 1984 by ODA from the Netherlands. Both Don Tay and Don Neua villagers used pumped water, covering roughly 227 ha of paddy field. In 2000, villagers established a water users association (WUA), the members of which paid a 150,000 kip/ha irrigation fee annually. The WUA assumed responsibility for managing the pump, including minor repairs. Ten groups of farmers under the WUA were responsible maintaining water channels. The WUA was reluctant to pay electricity charges to the government (for unknown reasons), and unpaid dues reached nearly 80 million kip in March 2003. 6) Land rent was paid with a one-third share of production in the rainy season, whereas in the dry season tenant farmers paid a fixed amount of paddy (three bags per rai, equivalent to 0.63 ton/ha). 7) The non-farm households were either new immigrants (five households; hereinafter, HHs) or households newly separated from parents (two HHs), engaged in wage labor (four HHs), jees brewing (two HHs), goldsmithing (one HH), and shop keeping (one HH). 8) Two different institutions provided seed money. The initially disbursed 2.5 million kip had to be repaid in installments within 25 years with no interest, but they did not have to repay the next 1.5 million kip in a specific time, but they did have to pay interest of 1.5% per month. When compared to the group’s accumulated savings (50 million kip in November 2002, 500 million kip in March 2005), the size of the seed money was not significant. 9) Khet was an administrative unit in Laos between district and village, but it had been abolished before our first survey in 2003. The management of the SGs, however, still utilized it. 10) Pakngum District is composed of six khet, and khet no. 5 contained eight villages, including Don Neua. 11) During the initial 10 months from October 2000 to July 2001, the minimum amount was 5,000 kip. Each SG could determine its regulations to a certain degree. 12) During the initial 10 months, the interest rate was 3% per month. However, because of the strong demand for credit, the interest rate was raised to 4%. 13) The major expenditure items included furniture, stationery, meeting expenses (primarily food), travel cost, and donations to temples/festivals. 14) The committee members and the consultants were selected by vote for a one-year term, although re-election was allowed. 15) If we consider the high inflation rates in Laos as stated in footnote 19, the real bank saving interest rates were chronically negative, which also contributed to the increased deposits to the SG. 16) It seems that our intervention by conducting the survey encouraged greater villager participation in the SG, although we did not promote it. 17) The committee members stated that they strongly encouraged members not to withdraw savings even when they need it, and encouraged them to borrow from the SG. 18) As Table 7 reveals, members usually deposited considerable savings in the month following dividend distribution. 19) As the Laos inflation rate decreased substantially after 2001 (19.1% in 1995, 19.2% in 1996, 19.5% in 1997, 90.1% in 1998, 128.4% in 1999, 23.3% in 2000, 7.8% in 2001, 10.7% in 2002, 15.5% in 2003, 10.5% in 2004, 7.2% in 2005, 6.8% in 2006, 7.6% in 2008, 0.0% in 2009, 6.0% in 2010, 7.6% in 2011, and 5.1% in 2012), we can safely say that the amount of total funds of the SG increased sharply in real terms as well. 20) The real lending interest rates were also lower than 48% per annum if we consider the high inflation rates in Laos stated in footnote 19. 21) The major periods of time deposit were three months and six months. 22) Business loans were disbursed mainly for working capital for trading activities. 23) According to a woman in the study village interviewed in March 2004, when she borrowed 5 million kip from APB for pig raising under an individual lending system, she had to submit three kinds of certificates (family certificate, address certificate, and collateral certificate), curriculum vitae, and six photos, in addition to paying a 120,000 kip processing fee. After submitting all the necessary documents, she waited roughly two months until the disbursement of the loan. 24) The other contribution of the SG was that its welfare fund gave financial assistance to villagers for funerals and for travel expenses for selected students. 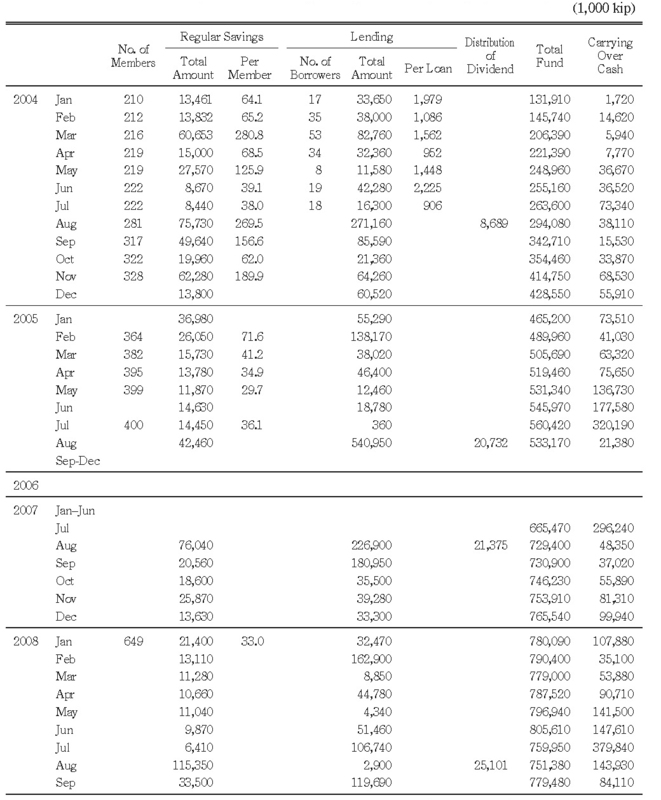 25) Because bank savings interest rate was lowered to 5% per annum in 2005 (Fig. 1), even the SG decreased the dividend rate to 1.9% per month which was still much higher than the bank rate. 26) The author could not determine how the 96 million kip NPLs in 2008 became 800 million kip in 2012. The NPL details in February 2012 were as follows. Of the five outside borrowers, two borrowers (one teacher with 17 million kip and one farmer with 91 million kip) had promised to complete repayment within two months, as expected by the committee, with the help of the khet-level SG. The farmer would repay the loan by selling his farmland. (The prevailing land price in the area was 52 million kip per rai [=0.167 ha].) Of the remaining three borrowers, two were farmers with a total of 400 million kip, and one was an owner of a construction company with 300 million kip. There was no clear repayment solution for them at that time. 27) Women’s Empowerment in Communities Project (WECP) succeeded CODI in monitoring the SG. 28) According to a FIAM Thai officer (interviewed on August 31, 2007), FIAM established “Lao league of village banks” in July 2004 with 17 committee members and at the time of the interview 65 SGs were the member of the league. The system is that SGs with excess funds can deposit to the league with an interest rate of 1.5% per month. On the other hand, SGs that want to borrow from the league should pay 3% per month interest. The profits are distributed to shareholders (25%), bonus for staff (10%), bonus for the committee (10%), “Education fund” (10%), “welfare” for the committee/staff (10%), reserved fund (27%), etc. 29) On the other hand, according to an officer of CODI (interviewed on September 3, 2007), CODI organized a bank at the district-level LWU and provided a fund of US$5,000 to each during 2002–05 through the headquarter of the LWU. The margin of 0.3% per month interest is taken by the headquarter whereas 1.2% margin is taken by the district LWU. Finally, the village SG takes a margin of 0.5% so finally the interest rate paid by SG members becomes 2.0% per month. In this case, the high intermediary margins seem to be a problem.